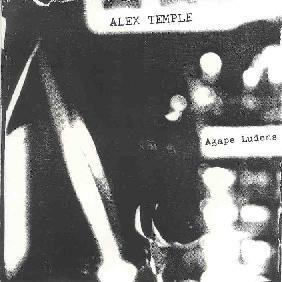 Alex Temple - "Agape Ludens"
Alex Temple is a Massachusetts based musician and sound sculpture who explores a variety of free-improv, chamber, and avant-prog stylings within a primarily electronic music context. Temple creates most of the music himself using synthesizers, samples, noise, effects, piano, dulcimer, voice and homemade percussion, though there are guests on guitar, voice, flute, and even power windows and drunken telephone call (I got a kick out of those). The set opens with my favorite track, "MBFEGW", which is a whimsical instrumental that draws heavily on the Rock In Opposition school of avant-progressive rock and chamber music. Temple moves through a number of themes incorporating quirky Etron Fou styled organ and structures, the hodgepodge experimentalism of Aksaq Maboul, and a general aesthetic that blurs the lines between free-improvisation and adventurous rock composition. Temple transitions through a number of themes throughout the 9 minute piece, at all times achieving a blend of frenzy, intensity, atmospherics, and carnival-like fun. Another highlight of the set is "Barb'ra/What A Life", which is an experimental space exploration with Laurie Anderson styled voicings by Stephanie Neely. It's an intriguing blend of Klaus Schulze, Philip Glass, Laurie Anderson, and maybe even The Residents. Tough to describe but another one of my favorites. "More Pockmark" is a short tune that combines melodic jazzy guitar with electronic noodlings. With "Static The Sky Into Submission", "That Moon" and "Static The Sky Back Into Submission" we're getting into more abstract spacey/noisey sound sculpture and tape collage territory. It took me a while to figure out that the efx'd voices were creating some of the electronic fun. And I love how out of nowhere we get this freaked out jazz/noise bit with piano and keyboards against a percussion groove created out of static and massive walls of white noise. "Than Surface" is a classical piece with an experimental edge. "Dance For A Broken Marionette" is similar, but more of a completely off-kilter but high energy electronic work. Temple does an impressive job of creating continual turn-on-a-dime constructions, and I can imagine this being the soundtrack to some avant-garde short film. Finally, "85% Of The City" is a parade of atmospherics, samples, noise bits, flute and piano lines, and spoken word poetry. Lots of interesting ideas and certainly in the same mode as the rest of the album, but this one didn't flow as well as the other tracks, and therefore didn't hold my attention throughout its nearly 12 minute length. But despite this last track, Temple has proved that he can string together varied challenging sounds and ideas in a cohesive and creative manner, and with lots of interesting freaky strangeness. There's plenty here to appeal to different crowds, including fans of experimental electronics, sound-art, and avant-progressive rock of a more abstract nature. For more information you can visit the Electric Walrus Records web site at: http://isomerica.net/~electricwalrus.